NEW CITY—Clarkstown Supervisor George Hoehmann announced on Feb. 4 the creation of the Clarkstown Business and Economic Development Advisory Committee that is now charged with developing a strategic, pro-growth plan for the town. The committee will focus initially on studying continued shifts occurring in the town’s vitally important retail sector and ways the town can partner with businesses to further solidify its position as the place for retail in Rockland County and the greater metropolitan region. “Clarkstown has served as the retail hub of Rockland County and the region for the last century. This committee will help solidify and strengthen our position for years to come,” Supervisor Hoehmann said. The committee includes a number of local business leaders who will lend their expertise to the town and produce specific recommendations on how the town’s zoning and building codes can be maximized to attract not only retailers, but other types of industry to the town. The committee will be chaired by Howard Hellman, chairman of All Bright Electric and a member of the Rockland County Industrial Development Agency. Other committee members include: Steven Yassky, president of Rockland Realty; Walter Goldman, Business Expense Advisors; Rob Mayer, president of Autopro LLC; Raja Amar, president of Portables Unlimited and a member of Rockland County IDA; Brion Hayman, president of Gateway Building Services; Michael Shilale, principal of Michael Shilale Architects, LLP; Mark Glasel, associate broker, Triforce Commercial Real Estate; Jeremy Schulman, president of Rockland Economic Development Corp.; Phyllis Tucker, director of operations and marketing, Rockland Economic Development Corp.; Al Samuels, president of the Rockland Business Association; Rene Rodriguez, president of the New City Chamber of Commerce; Risa Hoag, president of the Nanuet Chamber of Commerce; Jose Simoes, Clarkstown Town Planner; Albert T. Moroni, Chief of Staff and Robert Alberty, Director of Finance. • Improving the way the town promotes and facilitates various approval processes for those seeking to do or expand business in Clarkstown. • A comprehensive look at trends in the retail sector and how they inform the sustainability and long-term growth of retail in Clarkstown. • The development of a marketing plan to reach emerging retailers who are looking for an ideal environment to shape their business spaces to attract consumers that live in the metropolitan area. • The formulation of a framework for a complete economic development plan to be incorporated into the town’s Comprehensive Plan, which is set to begin work in 2020. • To make recommendations for potential changes to building and zoning laws to be considered by the Town Board to help promote business development and growth within the town. 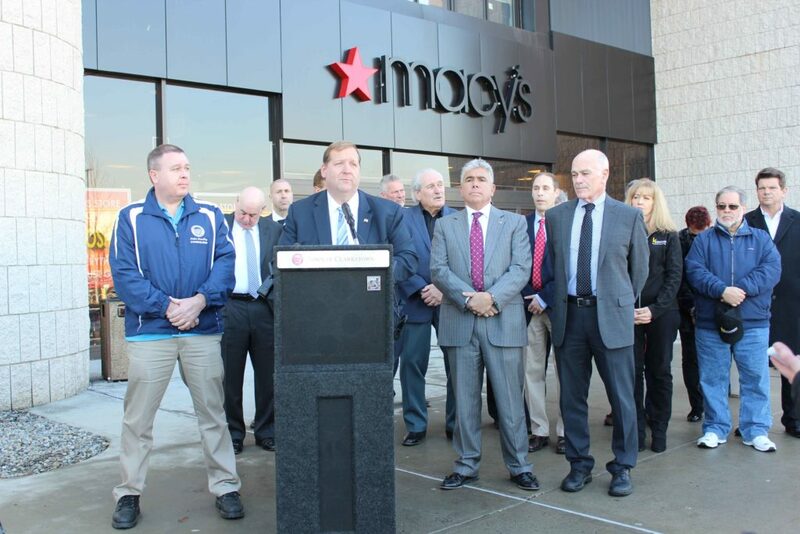 The press conference was held at the soon-to-be redeveloped Macy’s at the Shops at Nanuet, which has served as the anchor store since 1969. The location is emblematic of how times have changed, but also an example of how retail spaces are being re-imagined. Recently, the acquisition of the property was made by Metropolitan Realty Associates, whose CEO Joseph Farkas is redeveloping the space to include the new home furnishings retailer, At Home. “The Town of Clarkstown was the perfect location for this type of redevelopment. Clarkstown is at the heart of this region, with an abundance of ways for people to access it. Supervisor Hoehmann and his team have been effective partners in bringing about this redevelopment,” Joseph A. Farkas, CEO of Metropolitan Realty Associates said. Clarkstown is Rockland County’s economic engine, accounting for 60% of the commercial ratables in the county. The two major malls that call Clarkstown home account for at least 25% of the total sales tax collected countywide. From a tax assessment perspective, retail locations account for approximately $44 million in real estate taxes collected for the Town of Clarkstown and the school districts within the town. “As the town approaches finalizing the Nanuet Transit Oriented Development and begins work on a comprehensive plan, I am confident that the members of this important committee will be instrumental in laying the foundation for a dynamic economy for Clarkstown for the next generation,” Supervisor Hoehmann said.